City pages display all your contributions within a given city or place - reviews, ratings, photos, videos, forum posts, trip lists, and traveller articles. You can navigate to a city page from the city tiles on your main profile page. You can also get to city pages from the pins on your travel map. Simply click the city name. You can view your city contributions in grid (visual) view or list view. City pages are viewable on your own profile, or someone else's. Browse another member's city pages for trip-planning ideas. 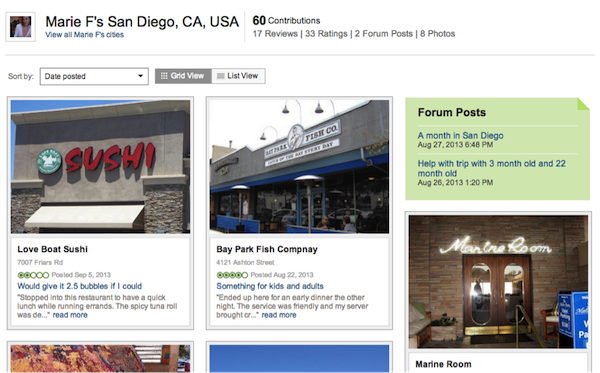 If you are logged in, you can even pin those places (restaurants, attractions, hotels) to your own city pages.